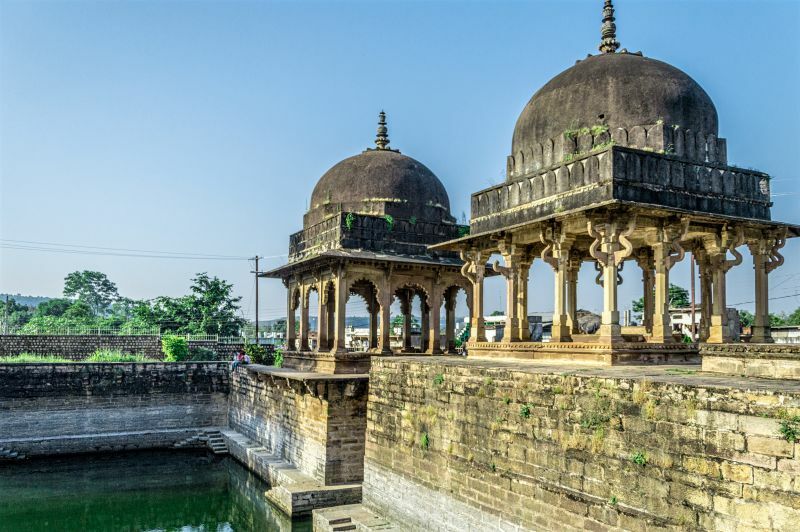 Chanderi is a small town nestled in the Vindhyachal mountain ranges in Madhya Pradesh, wherein River Betwa flows on one side (Now a dam has been built on it) and small hills forming a natural defence structure on all the three sides. It lies on the borders of the Bundelkhand and Malwa region of Madhya Pradesh. Presently it is in Ashok Nagar Distt of Madhya Pradesh. 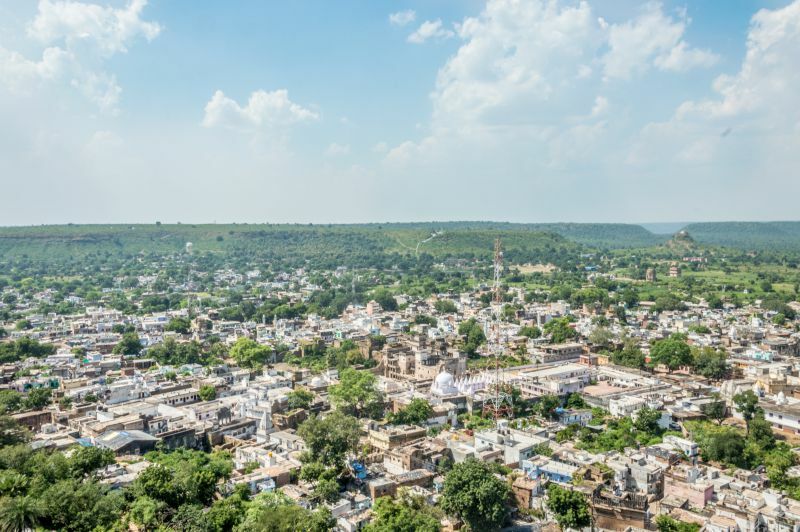 This small town of Chanderi was a gateway to Malwa region Deccan Plateau and thus it was a highly contested place between Muslim Kings and The Rajputs. Chanderi is composed of Labyrinth of lanes. Every lane has one or the other heritage building, which has an interesting story to tell. As there is no documented history of early Chanderi, so there is no consensus about when Chanderi was Founded. As per a legend, Chanderi was established by king Shishupal, Cousin of Lord Krishna in Mahabharata period. He is also known as chedi Naresh and his capital was “Boodhi Chanderi” a ruined city 22 kilometres from Chanderi. In Baudh literature, Chedi, Cheti are mentioned a no of times and was one of the 16 Mahajanpads or the states. 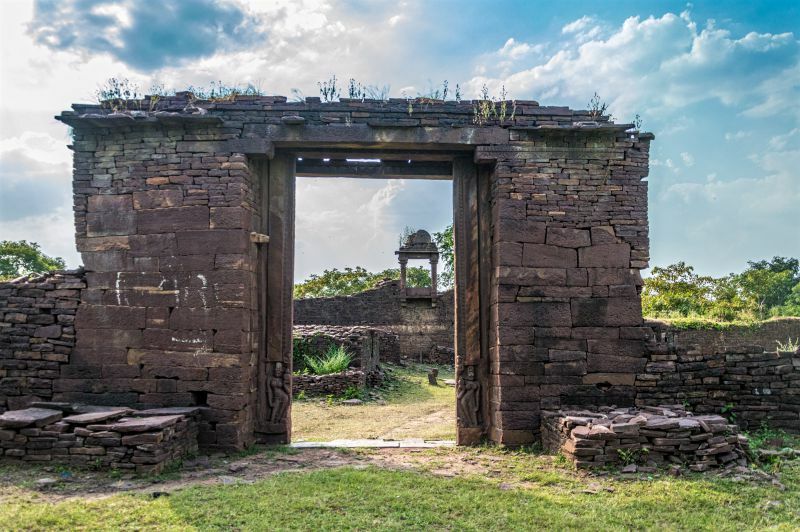 In the eighth century, it came under the rule of Gurjar Pratihars and it is believed that the name got distorted from Chedi to Chandrapuri to Chanderi. In the 11th century inscriptions found, the 11 kings of Gurjar Pratihar dynasty in chronological order are found. The Construction of the Chanderi Fort or Kirti Durg as it is called is attributed to King Kirtipal the 7th king in chronological order of Gurjar Pratihar dynasty. After Pratihars, Kushwaha dynasty started ruling the area and shifted the capital to Narwar. In 1251-52, Giyassudin Balban of Ghulam Dynasty attacked Narvar and usurped power from Chahardev Kushwaha. So Chanderi automatically became the part of Ghulam dynasty. Later on in 1296, Allaudin Khilji, who was not yet the king and a commander for his Uncle Jalalludin Khilji attacked and won it. From 1296 to 1316, the Khiljis ruled Chanderi. Chanderi being an important military outpost, important and powerful governors were appointed. The three important governers were Malik Kafoor, Ain ul Mulk Multani, Malik Tamar Sultan. Later on, Chanderi fell in the hands of Tuglak dynasty. In 1392, Dilawar Khan Ghori established an independent state in entire Malwa region. Reference to his name is found in Dilli Darwaza, Jama Masjid and Basant Baddu ki Masjid. In 1404, his two sons established two separate kingdoms. Qadr Khan had Chanderi as its capital and Hoshangshah established Mandu as his capital. A lot of construction of monuments is attributed to him like Singhpur Talab, Nizamuddin Aulia family tomb. Later on, Chanderi was won over by Rajput King Rana Sanga, who established Medini Rai one of his trusted allies as King of Chanderi. Medini Rai was attacked by Babur in 1528. This is when Chanderi saw maximum bloodshed and the largest Jauhar in the history of India. Babur became victorious. When his son Humayun became king, SherShah Suri defeated him and established his kingdom. After Humayun's death, Akbar added Chanderi in Mughal empire. His son Jahangir under his kinship handed over the rule to Bundela Rajputs. In the uprising of 1857, Mardan Singh Bundela was defeated by the British. In an accord with Scindias on Gwalior, the rule of Chanderi remained with Scindias till independence. 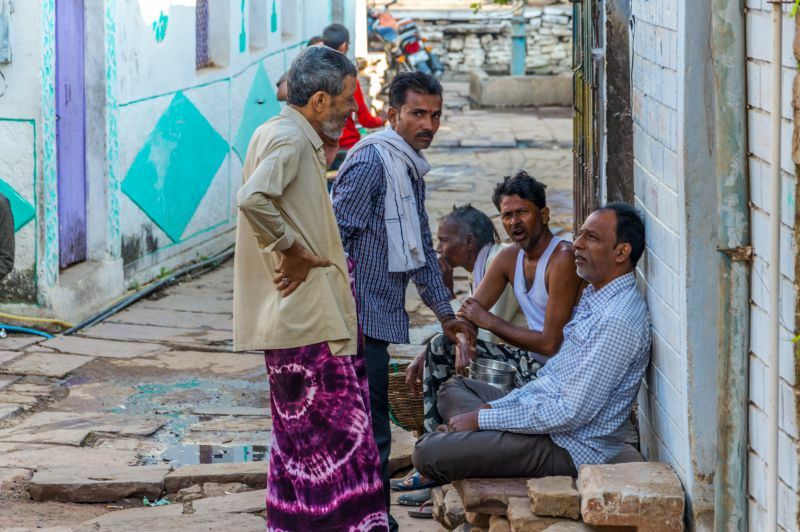 The population of Chanderi is approximately 35000 consisting mainly of Hindus, Muslims, Jains and Adivasis. The beauty of the Chanderi is the harmony with which these communities coexist. One incident I have quoted in the starting of the post. 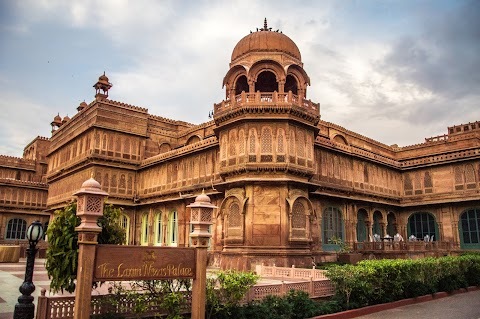 Another incident that was quoted by our guide is that when after the partition of India, one Muslim family wanted to move out of Chanderi to go to Pakistan. The people of other communities gathered around their house and knocked. When the head of the family came out, he saw all those people had kept their Pagdis (headgear) in front of his door and they said if you want to go to Pakistan, you will have to walk over these Pagdis. Such a gesture moved the family and they dropped the idea. 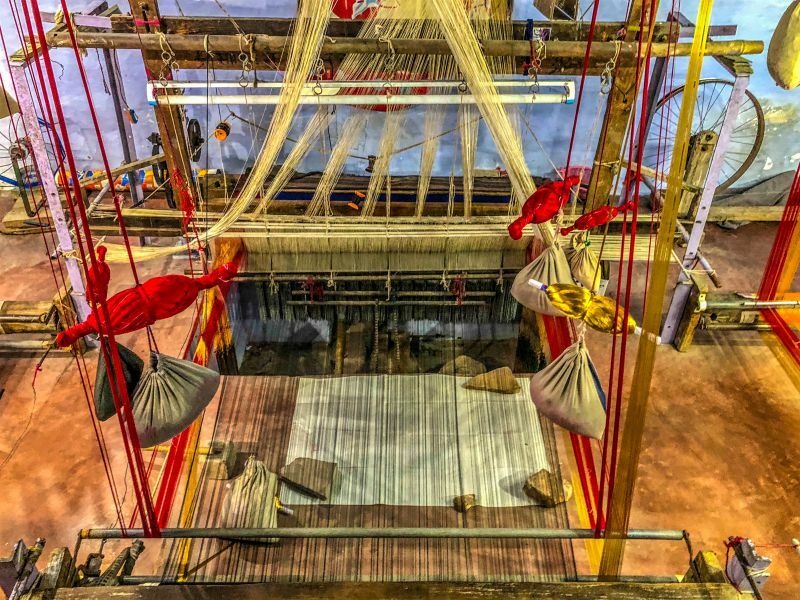 The trading is mainly done by Jain community who supply raw material to weavers, who are mainly Muslims and stand by each other in thick and thin. The architecture of Chanderi is a mix of Hindu, Bundela, Rajput and Mughal architecture. A beautiful insight by Mr KV Singh – CMO Chanderi, who was kind enough to be our guide for Kirti Durg and Kati Ghati trip explained it beautifully. Lotus and a tusker are Hindu symbols, which co-exist with the latticework – a symbol of Muslim architecture in the mosques and other places. This feeling of oneness can be found in their folk songs also. The Chakla Bawdi is an example of the amalgamation of two architectural styles. The arches on the cenotaph closer are of Bundela Rajput style and those on the distant one are of Mughal style.